With the agenda “Together for the climate—Acting and negotiating in Bonn” the United Nations Day took place in Bonn on 14 October 2017. 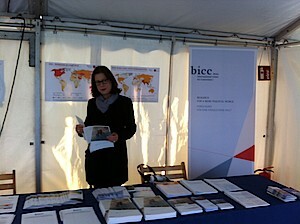 BICC participated in the comprehensive programme with an information booth in tent 6 on the Market Square. The United Nations Day 2017 in Bonn is an opportunity for UN Secretariats, Federal Agencies and International Organizations to showcase their work. Projects and cooperation activities, all with the focus on the Sustainable Development Goals (SDG) and especially Goal 13 “Climate action”, will be presented. BICC presented material illustrating the nexus between climate change and conflict, based on the interactive “Information Portal War and Peace” of the German Federal Agency for Civic Education (bpb) and BICC (Sicherheitspolitik.bpb.de).